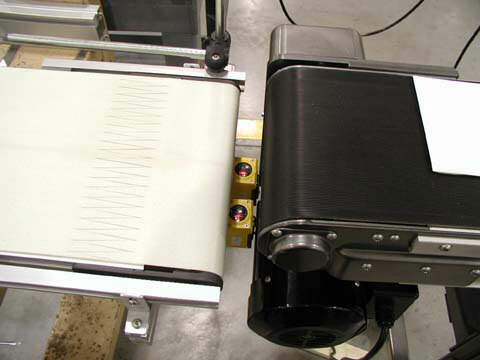 A CD and DVD manufacturer needed to improve the inefficiencies created by excessive manual handling on a packaging line. Downtime and low productivity were unacceptable. The application required the counting and separation of CD sleeves into groups of 25 pieces. Operators were doing this manually and needed to be freed up to manage the entire packaging line. Dorner provided a 2200 Series conveyor equipped with a photo eye, counter eye, timing module and variable frequency drive. The system would count and shingle the CD sleeves as they were fed onto the conveyor. Once the count of 25 was reached, the conveyor speed would ramp up for a short period of time and return to normal speed, thus creating a gap between groupings of 25 pieces. This created the visual gap needed between product groupings. The need for two line technicians was reduced to one allowing that person take on other duties. The customer states that productivity was also increased by 50%.